I'm going to tell you something. I was terrified of making crepes. I pondered purchasing a pack of pre-made crepes from the grocery store and trying to pass them off as homemade. Of course, I would have told you that I took a shortcut, but I decided against taking the easy way out. After all, this project is all about trying new things and stepping out of my comfort zone. By the way, the picture should tip you off that the dominant flavor of these was Cognac. Setting aside the terror they induce, crepes are quite possibly one of my favorite things to eat. A simple crepe drizzled with bright lemon juice and sprinkled with sugar is the perfect addition to a stroll around the farmer's market. I have had savory crepes with ham and Gruyére cheese, I have had sweet crepes slathered with Nutella, and I have even had a crepe with just a dollop of butter inside. However, I had never tasted a crepe quite as complicated or with so many layers of flavor as these. I adore apples, and anything mixed with a little bit of Cognac can never be bad. The sheer deliciousness of the name of these crepes helped convince me to make them, and boy am I glad I did. Mmmmmmmmmm.....I really can't describe the flavor of these crepes. The picture really doesn't do them justice; they were actually quite lovely to look at, but the early morning light was not very conducive to photographs. The flavor lingers in your mouth for a long time after you finish eating them, becoming more and more delicate as time passes. The texture of the crepes was perfect, just springy enough with a little bit of interest from the browned bits. I advise you to make these very soon, as a friend of mine said, "These are the best crepes I've ever had, and I've been to France." Warm milk, salt, sugar, and butter over low heat until butter melts. Whisk in flour, eggs, and beer. Whisk until batter is well blended and press through a strainer into a bowl. Refrigerate for at least an hour. Let batter return to room temperature. Place lightly oiled 8-inch nonstick skillet over medium-high heat. When it is hot, whisk batter and ladle 2 tablespoons batter into pan. Quickly swirl pan to spread batter into an even layer and return pan to heat. Let crepe cook for about 1 minute, loosening edges with a butter knife as it cooks. When the surface of the crepe is covered with small bubbles, flip over and cook for 30 seconds more. Turn crepe out onto a plate and repeat with remaining batter. Beat butter, powdered sugar, Cognac, and vanilla together. Spread 2 teaspoons Cognac butter over 1/4 of each crepe, folding it until you have a quarter circle. Sauté apples with 1 tablespoon butter until soft. 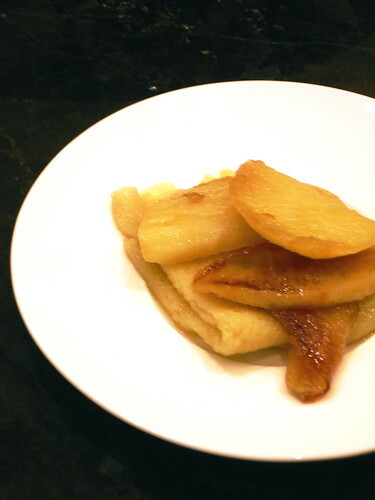 Add 1 1/2 tablespoons sugar and cook until apples caramelize. Transfer apples to a bowl and add apple cider and remaining 2 tablespoons sugar to pan, increase heat, and reduce cider by half. Reduce heat and arrange butter-filled crepes in pan with cider. Return cooked apples to pan. Reduce heat, add Cognac and vanilla, and simmer to heat crepes and apples for about 1 minute. Serve immediately. I have to say that we're happy you made them! These were really quite delicious.